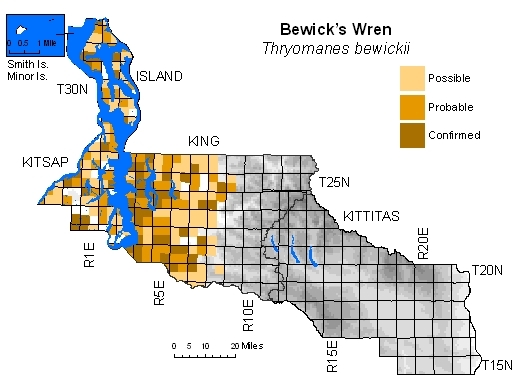 Common at low elevations in Kitsap, Island, and King Counties in shrubby habitats, especially residential and agricultural areas. Also occurs in clearcuts and along rivers and wetlands. Rapidly colonizing eastern Washington. Although not confirmed from Kittitas County during atlas period, has extended range up Yakima River to at least Umtanum Creek in recent years. 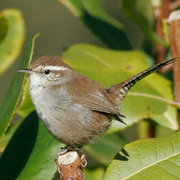 Stepniewski (1999) describes Bewick's Wren as uncommon to rare resident in Yakima County just south of Kittitas County.